(UPM RFID, Tampere) - UPM RFID and partners are introducing the latest NFC and RFID solutions for retail industry at the National Retail Federation's (NRF) 101st Annual Convention and Expo in New York City, NY, USA. Retail's Big Show 2012 will take place at the Jacob K. Javits Convention Center on January 15-17, 2012. The NRF annually draws more than 20,000 retail professionals from over 80 countries to learn about the latest technology innovations. 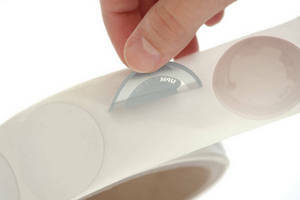 UPM RFID and partners, Blue Bite, Mid-South Marking Systems, Overheer Systems and Pittsfield ID will be showcasing the most recent RFID solutions based on real-world NFC and RFID applications. The RFID solutions at the event utilize the latest UPM RFID tag and inlay technology for digital marketing, customer engagement and experience, merchandising, item-level tagging and inventory management and much more. o An NFC-enabled out-of-home advertising / retail display from Blue Bite, using embedded UPM BullsEye(TM) NFC inlays in posters to enable various rich media interactions for products when tapped. o An EPC tagging solution from Mid-South Marking Systems utilizing a chip-based serialization approach to be deployed out of the box at any worldwide location. There is no need for costly integration, connectivity or third party management. The system features the UPM Belt(TM) UHF inlay and the Zebra RZ400 RFID Printer / Encoder. o An item-level demonstration solution from Overheer Systems, using UPM RFID UHF inlays to provide retailers with improved visibility, security and location in the inventory. o A retail marketing system, InMotion(TM) from Pittsfield ID, presenting their proprietary motion detecting RFID technology to enhance the customer experience and collect merchandising data in retail. Also at the NRF event, UPM RFID will be presenting SMARTRAC, a leading global supplier of RFID transponders covering a comprehensive range of applications in all current frequency standards. UPM reached an agreement with SMARTRAC N.V. on 22 December 2011, whereby UPM will sell its RFID business to SMARTRAC. The deal is expected to be closed by the end of the first quarter of 2012. Read more about the event at http://www.nrf.com/annual. Blue Bite is a leading mobile-marketing solutions provider utilizing a targeted, location-based approach to reach captive audiences on their personal mobile devices via NFC. Blue Bite has partnered with many of the leading Out-of-Home Companies in the U.S. and prides itself on creating an interactive two-way medium by enabling consumers to connect with digital and traditional media via the mobile phone. For more information, please visit www.bluebite.com and www.theMTAG.com. Mid-South Marking Systems delivers best-in-class RFID item-level tagging solutions for retail compliance by combining its customized PortalTrack® RFID software with industry leading products from UPM RFID, Impinj and Zebra Technologies. For more than 25 years Mid-South Marking Systems has provided solutions focused on integration of Auto-ID technologies for a wide range of industries including manufacturing, retail, healthcare, pharmaceutical, government, and distribution. Leveraging expertise in barcoding and RFID technology, the company has tailored solutions for customers worldwide. More information can be found at www.midsouthmarking.com. Overheer Systems designs item-level RFID solutions for apparel and footwear retailers. With sales becoming more and more difficult and competition more fierce, it is critical for the retailer to secure every potential sale. The company's item-level RFID system allows the retailer to capture real time inventory information on item location and security data more accurately and quickly than traditional systems. Gain visibility into your most important asset, your inventory, by using Overheer Systems' Reflect software. For more information, please visit www.overheer.com. Pittsfield ID has been working with top tier brands for over 80 years. Pittsfield ID's inMotion(TM) retail marketing system is a leading innovation in retail customer experience. InMotion(TM) detects and responds to the actual motion of products, interacting with retail customers about the product in their hands and offering useful information and brand message. Leveraging UPM RFID inlays and Pittsfield ID's motion detection technology built on a robust radio frequency software engine, inMotion(TM) delivers a naturally interactive in-store experience. InMotion(TM) is built to be intuitive and seamless to shoppers, while supplying valuable merchandising and marketing data to retailers and brand owners on product activity. More information can be found at www.pittsfieldid.com and www.inmotion-marketing.com.